A team of U.S. and German scientists has used a system of large magnetic "trim" coils designed and delivered by the U.S. Department of Energy's (DOE) Princeton Plasma Physics Laboratory (PPPL) to achieve high performance in the latest round of experiments on the Wendelstein 7-X (W7-X) stellarator. The German machine, the world's largest and most advanced stellarator, is being used to explore the scientific basis for fusion energy and test the suitability of the stellarator design for future fusion power plants. Such plants would use fusion reactions such as those that power the sun to create an unlimited energy source on Earth. The new experiments amply demonstrated the ability of the five copper trim coils and their sophisticated control system, whose operation is led on-site by PPPL physicist Samuel Lazerson, to improve the overall performance of the W7-X. "What's exciting about this is that the trim coils and Sam's leadership are producing scientific understanding that will help to optimize future stellarators," said PPPL physicist Hutch Neilson, who oversees the laboratory's collaboration on the W7-X with the Max Planck Institute of Plasma Physics, which built the machine and now hosts the international team investigating the behavior of plasmas confined in its unique magnetic configuration. Stellarators are twisty, doughnut-shaped facilities whose configuration contrasts with the smoothly doughnut-shaped facilities called tokamaks that are more widely used. A major advantage of stellarators is their ability to operate continuously with low input power to sustain the plasma without plasma disruptions — a risk that tokamaks face — enabling the facilities to operate efficiently in steady state. 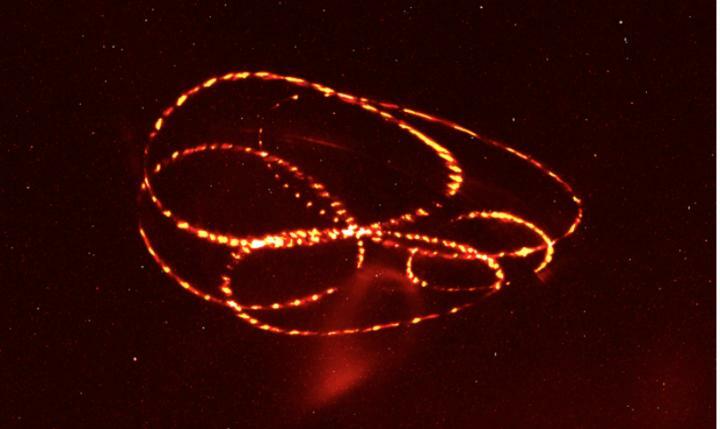 A disadvantage is that the twisting stellarator geometry is more complex to design and build. The W7-X completed its second round of experiments in December with improved heating and measurement capabilities. A special feature of the second round was its use of an "island divertor" to exhaust heat and particles leaving the plasma. This important tool consists of a chain of specially shaped magnetic fields at the edge of the plasma intersected by 10 divertor plates. Any deviation of these fields from their designed configuration can cause the divertor plates to overheat and limit the performance of the plasma. The recent experiments demonstrated the ability of the trim coils to measure and correct such deviations, which are known as "error fields." Controlling such fields at the edge of the plasma enabled the W7-X to produce plasma discharges lasting up to 30 seconds. "The trim coils have proven extremely useful, not only by ensuring a balanced plasma exhaust onto the divertor plates, but also as a tool for the physicists to perform magnetic field measurements of unprecedented accuracy," said Thomas Sunn Pederson, Max Planck director of stellarator edge and divertor physics. Achieving the control required the trim coils to perturb the magnetic field in a way that made clear the size of the error field. Complementary experiments by Lazerson and Max Planck scientist Sergey Bozhenkov then confirmed predictions of the needed power of the trim coils to correct the deviations — an amount that equaled just 10 percent of the full power of the coils. "The fact that we only required 10 percent of the rated capacity of the trim coils is a testament to the precision with which W7-X was constructed," Lazerson said. "This also means that we have plenty of trim coil capacity to explore divertor overload scenarios in a controlled way. Support for this work comes from the DOE Office of Science.